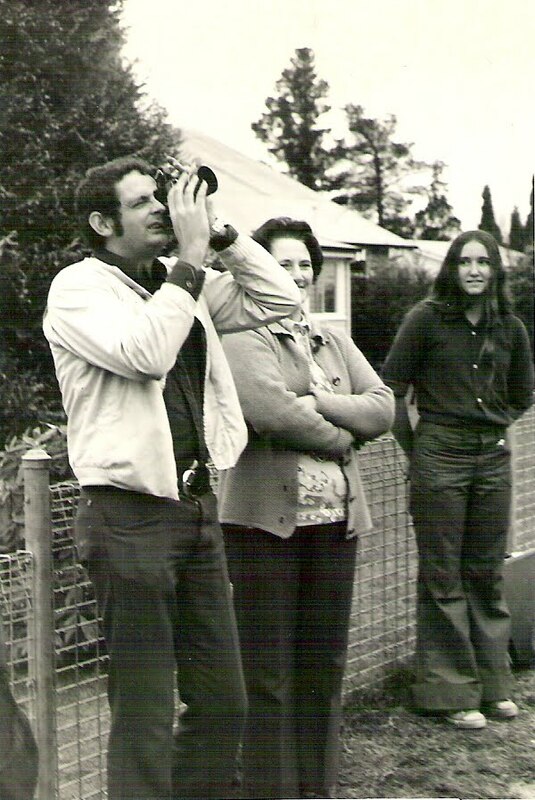 David Buching, who was one of the key people in the transitional period of reorganisation of the Sydney based group UFOIC – UFO Investigation Centre - in the 1970s, passed away on 29 April 2010. I was lucky to have David as a friend during this period. He was a forceful and active agent of change who energised the faltering group and helped kick-start it again into an active investigative group after a period of limited activity. UFOIC had lost its active focus with the accidental death of its long time dynamic president Dr. Miran Lindtner in August 1969. David Buching had gone to a UFOIC meeting a few months before - his first UFO meeting. He was impressed with Miran Lindtner and was starting to get into the UFO subject in an active way. David eventually joined a new group formed by Frankh Wilks UFO Research Projects of Australia (UFORPA) which seemed to have a more active focus on research and investigation, than the faltering UFOIC. David was joined in this UFO adventure with his wife Penny. Together with other active researchers he eventually found he wanted to focus more specifically on in depth UFO investigations. This focus eventually resulted in a reinvigorated UFOIC, with active members from both the remnants of UFORPA and UFOIC. All of these developments were not really on my horizon. I was yet to make the move to Sydney and was originally a country member of UFOIC – my home town being Grafton. From 1971 to 1974 I was attending the University of New England at Armidale and took my UFO interests with me. It was an intense UFO flap on the Dorrigo plateau centred at the small village of Tyringham in 1973 that eventually brought me into contact with David Buching and his band of active UFO players. He had learnt of my extensive field investigations there and his team made a number of trips to the area. I well remember the first meeting we had at a property at Tyringham where I was based during my investigations there. David and his team had arrived after the long drive from Sydney. As they opened the back of the station wagon is was clear that investigation equipment was not the only priority and that a large amount of space was taken up by crates of Cola Cola which was meant to sustain David’s addiction to it. I immediately took an enduring liking to David and his friends. When I eventually moved to Sydney in 1975 David and Penny’s place at Chatswood and the circle of friends that seemed to orbit around it was a very welcoming respite from the challenges of establishing myself in the big city, me being a country lad. I enjoyed doing a number of investigations with David including the intriguing Bents Basin “robot” UFO encounter of 1972. We became aware of the incident in 1975 and conducted an on site investigation together. The location brought together two of David’s interests – UFOs and the “supernatural” – Bents Basin was haunted by a reputation for strange phenomena, including ghosts, “hairy men” (Yowies? ), and other oddities. We found a fascinating body of information that seemed to contribute to the areas strange legacy. However it was the weird 1972 events that was the centre of attention for us. Six young people claimed they encountered a UFO on the ground. What followed seemed to be a very frightening entity encounter that featured the apparent apparition of a “robot” like figure. Another impressive case that David investigated was a frightening encounter with a small UFO type object which appeared to issue smaller objects that seemed to attack a group of young people camping in the Norah Head area during 1975. Later I would investigate a striking case at the same location in 1973 where a larger UFO which also emitted smaller objects appeared to have an effect on a car nearby. The couple inside became very concerned when they were unable to start the car until the UFO departed. David appeared in a UFO documentary made by Roger Climpson for TV station Channel 7 early in 1973 talking about UFO occupants expressing the opinion that we may be being visited by more than one race of extraterrestrials. By 1976 other life priorities took David attention. We saw each other intermittently over the years but by the time I started undertaking detailed research into the history of the UFO group around 2005 I had lost track of him. We eventually reconnected and in December 2008 met at my place where I did a lengthy oral history interview with him. I am glad we had that opportunity to talk about times past and some of our current activities. I was shocked to hear he was in hospital and immediately went to visit him on Tuesday April 27. We talked for a couple of hours on a range of matters. Even though he wasn’t well we parted with the intention of catching up again to further discuss things when he was out of hospital. Sadly that was not to be. David passed away only two days later. I’ll miss David. His was a life well lived. He pursued things that interested him and we are the richer for that. David Buching's funeral service and farewell will take place at the Northern Suburbs Crematorium, Delhi Rd, North Ryde, Sydney, Northern Chapel, 12.15 pm, Friday May 7. Photos: The black & white photo shows David Buching in action investigating a UFO event at Wentworth Falls in 1974; the colour photo is of David in my study during our December 2008 discussions.